What an amazing comic. I had been waiting for this trade for what seemed like years. A story set in the future where humans are given awesome superpowers. But then they only have a life span of a year? Sign me up. I got this trade last week and I read the first nine issue's and it's good. Watchmen good. Yep, I said it. The story starts off by telling us of how a group of aliens called The Horde have been attacking the earth for the better part of four years. The Horde don't really attack the infrastructure of the planet because they really only know how to plunder. The Horde take what they need and maybe kill a few humans for fun or to instill fear. They regard humans as nothing more than animals. A group of humans are given a treatment called The Morituri process. It gives the person super human powers but, also, shortens the lifespan of any person who takes the process. The first group of hero's are called The Black Watch. They are adult soldiers who are given The Morituri process. They gain awesome powers and take the fight to The Horde. But because they are adults the Morituri process kills them very fast. So then as they move forward the Morituri process is only used on young teenagers. The first group of new recruits are given the Morituri process and become full fledged super heroes. They make T.V. 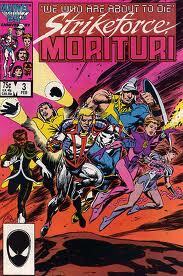 appearances and even have a Marvel comic published about them. The leader of the group is a kid named Harold Everson who gives up any chance for a normal life to come to the aid of his planet and defeat The Horde. Once the five new recruits are given powers they are taken to a place called the garden where they are thrown into real life or death situations to bring their powers to the forefront as quickly as possible. The gang make it out of The Garden in one piece. Some of the other recruits down the line won't be so lucky. The thing that stands out in this book is the writing and the art. I really like the way Peter B. Gillis writes the team. Some of the members have a great deal of regret once they take the process knowing that this is really the end. Some of them like Harold Everson seems to almost revel in it. But he also seems conflicted to a point just like real people do. Harold wants to do what's right and brave but has real fears about not being able to lead his team when they need him the most. I won't spoil his fate for you but it is rather shocking. By the way, the art by Brent Anderson is top notch. I've heard about his work before from Astro City. He is just a fantastic storyteller. Just look at the pacing and page layout. I defy to look at this whole trade paperback and find one useless panel. Go on, I'll wait. Back yet? Didn't find one? Good. Like I said, A plus work. This has been one nail biting read so I suggest you go out and buy this trade or hell if you see me I'll let you borrow my copy. Well, not really. But I feel that next time someone asks you for a comic that anybody can read without knowing superheroes don't give them Watchmen. Give them this.